A multi-tasking kitchen is a functional kitchen. That's why this handy 2-in-1 dish fits right into the mix! This hard-working wonder operates as a splatter shield atop plates and bowls in your microwave, but if you simply flip it over, it functions as a baking dish or a shallow serving bowl. 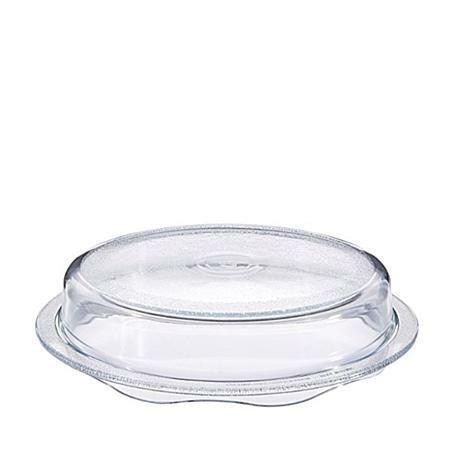 A scalloped, wavy edge allows you to steam bowls of veggies, and its extra-wide rim provides you with a secure place to grip when transferring it from your kitchen to the table. As with all glass cookware, should be used with care. Glass may be hot after use, and must be handled with heat-resistant oven mitts or pot holders. Been wanting a glass plate cover for MW oven (instead of plastic) for a long time. 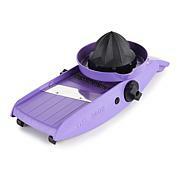 Except for its heavier weight than plastic, it is better in every way to plastic ones. No plasticizers. This is perfect for cooking & to use in the microwave. NOT ONLY SPLATTERPROOF BUT FOOD TASTES BETTER TOO! 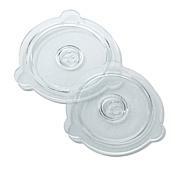 Not only does this keep your microwave clean from splatters but your food will taste better and hotter. Brilliant design. I turned my brother onto this and he uses it now too. I had been looking around for a splatter guard when using my microwave. Either the price was too much and quality poor, or not what I was looking for.This one fits just perfect in my microwave and I have used it several times since its arrival. No splatter or mess anymore in my microwave adding to more cleanup.I have not used it to cook something in, such as baking, etc., rather keep this strictly for my microwave. Overall, very good quality glass, not too heavy, and does what I wanted it to do.